This entry was posted in Academic achievements, Academics, Students and tagged Marshall Scholar, scholarship on November 15, 2013 by Wire Eagle. AUBURN UNIVERSITY – Auburn University senior Patrick Donnan has been named a recipient of the prestigious Marshall Scholarship, becoming one of only 40 U.S. students selected to attend their choice of university in the United Kingdom. Auburn native Donnan, who has a 3.98 grade-point average, is a student in the Honors College double-majoring in physics and music, concentrating on the bassoon, and minoring in mathematics. He is also a 2013 Barry M. Goldwater Scholar. “I am truly humbled,” Donnan said. “Receiving the Marshall Scholarship is the culmination of all the work that my professors and Honors College staff have invested in me these past three years at Auburn. Even if I did not receive the award, going through the application process was beneficial in itself as it helped me grow as a person. 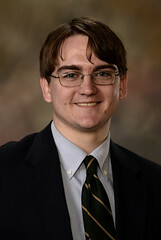 Donnan conducts research in Auburn’s College of Sciences and Mathematics as a member of the theoretical and computational atomic physics group. He is an editor of the Auburn University Journal of Undergraduate Studies and has co-authored four peer-reviewed publications, one of which was published in Nature: The International Weekly Journal of Science. Paul Harris, associate director for national prestigious scholarships in the Honors College, said, “I thoroughly enjoyed working with Patrick throughout the application process. He represents the very best of Auburn University and his generation. As a double major in physics and music, he is not only bright and intellectually engaging, but he also gives generously of his time and talents whether promoting research among his fellow physics majors or sharing his love for music as a member of the Auburn symphonic band. The Marshall Scholarship program was established in 1953 by an act of British Parliament in honor of U.S. Secretary of State George C. Marshall as an expression of Britain’s gratitude for economic assistance received through the Marshall Plan after World War II. The program is overseen by the Marshall Aid Commemoration Commission. Approximately 900 students are endorsed annually for the scholarship by their respective universities, for which 40 scholarships are awarded nationwide.